The Program was created by the Record of Decision (ROD) in 2000, which outlines the plan for restoration of the Trinity River and its fish and wildlife populations. It was the result of nearly 20 years of studies of the Trinity River and its fishery resources that culminated in the Trinity River Flow Evaluation Final Report (Flow Study). The Trinity River Mainstem Fishery Restoration Environmental Impact Statement/Environmental Impact Report (Trinity EIS/EIR), completed in 2000, was the NEPA/CEQA (National Environmental Policy Act of 1969; California Environmental Quality Act of 1970) document upon which the ROD was based. Environmental Compliance and Mitigation – measures to minimize or eliminate short-term impacts. This strategy does not strive to recreate pre-dam conditions; rather, the goal is to create a dynamic alluvial channel exhibiting all the characteristics of the pre-dam river, but at a smaller scale. Based on these reports, Congress concluded that water “surplus” to the present and future water needs of the Trinity and Klamath Basins — then estimated at approximately 700,000 af and considered “wasting to the Pacific Ocean” — could be diverted to the Central Valley “without detrimental effect to the fishery resources.” (H.R. Rep. No. 602, 84th Cong., 1st Sess. 4-5 (1955); S. Rep. No. 1154, 84 Cong., 1st Sess. 5 (1955)). In fact, the underlying reports suggested that development of the Trinity River Division, and the resulting diversions, would not only maintain but also improve fishery conditions in the Trinity River, with as little as 120,500 af of water per year from above Lewiston dedicated to the fishery. 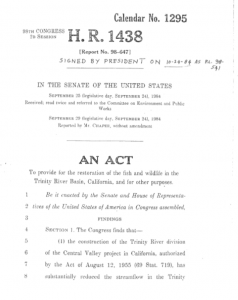 Based on these understandings, Congress passed legislation authorizing the Trinity River Division (TRD) on August 12, 1955 (PL 84-386) (1955 Act). 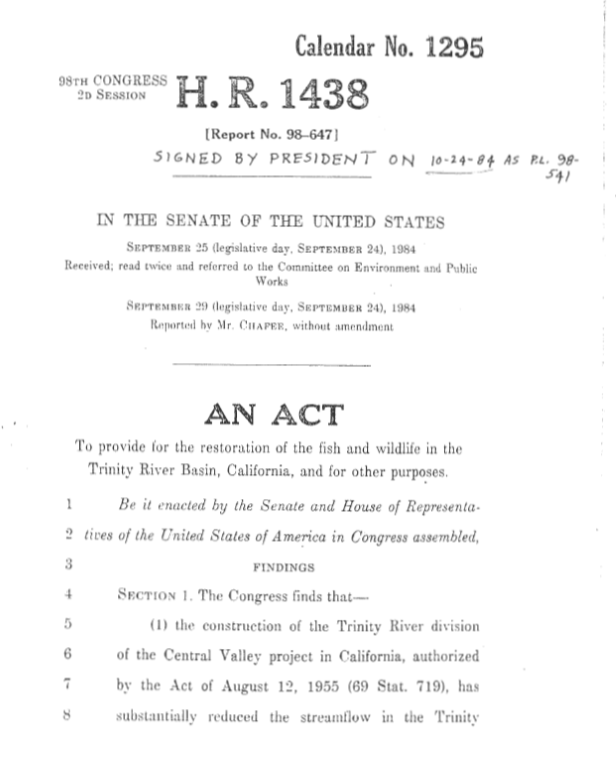 Although Congress authorized the TRD as an integrated component of the Central Valley Project (CVP), section 2 of the 1955 Act specifically directed the Secretary of the Interior to ensure the preservation and propagation of fish and wildlife in the Trinity Basin through the adoption of appropriate measures. The Trinity River Basin Fish and Wildlife Task Force was initiated in 1984 under PL 98-541 to restore and maintain the fish and wildlife stocks of the Trinity River Basin to levels that existed just prior to construction of the CVP Trinity River Division. The Central Valley Project Improvement Act of 1992 (PL 102-575) further supported restoration objectives and established completion dates for the program documents. The Trinity River Mainstem Fishery Restoration EIS was completed and the Record of Decision (ROD) signed on December 19, 2000, establishing the current Trinity River Restoration Program. The EIS calls for physical/mechanical restoration actions in the basin, as well as an increase from approximately 25 to 48 percent of the average annual inflow to Trinity Lake to be released to the River. CVP water and power users filed suit to prevent implementation of the ROD. On March 19, 2001, the Eastern District Court of California enjoined that part of the decision that provided increased flows for the Trinity River required preparation of a Supplemental EIS/EIR (SEIS), but allowed other aspects of the program to proceed. A contract for developing the SEIS was awarded in December 2001, to include additional analysis of impacts to power production and those resulting from implementation of the associated Biological Opinion. On April 19, 2002, U.S. District Court Judge Wanger modified the injunction to release more water in 2002, and proceeded to decide the merits of the case. On December 9, 2002, Judge Wanger granted the plaintiffs’ motion for summary judgment on the issue of the Federal defendant’s (Department of the Interior) failure to comply with the National Environmental Policy Act. The Court entered final judgment on April 7, 2003, and granted defendants increased river flows from 340,000 acre-feet to 452,600 acre-feet in dry or wetter years. The U.S., Hoopa Valley and Yurok Tribes, and Central Valley irrigators (Westlands, San Luis, and Delta-Mendota Water Authority) appealed the Court’s April 2003 judgment. Appeals were heard by the Ninth Circuit Court, and a final ruling was issued on November 5, 2004 in favor of the defendants that directs all aspects of the program to proceed and overturns the lower court’s requirement to complete the SEIS. Plaintiffs have indicated they will not appeal to the Supreme Court. In 2009, the Program worked with the North Coast Regional Water control board to develop the Master Environmental Impact Report for Channel Rehabilitation and Sediment Management for Remaining Phase 1 and Phase 2 Sites (Master EIR; NCRWQCB and TRRP 2009) to streamline the permitting processes under CEQA for the remaining restoration activities. The Master EIR functions as the programmatic document under CEQA, while the 2000 Trinity River Mainstem Fishery Restoration Final Environmental Impact Statement (Trinity River FEIS/EIR; USFWS et al. 2000) serves as the programmatic document under NEPA.